http://Ourtalk.net Considering Emergent Globalized Immediate Interaction. http://kdp.me #philosophy #thought #twitter #globalization — Now that there is a place where we can discuss things with a bit more leisure, it behooves us to begin thinking about this new media that we are engaged in so frenetically. The concept behind OurTalk.net is to leverage the technology for discussions of the meanings of the affairs that we find ourselves immersed in realtime as events occur on the ground rather than being mediated by Media. A world event occurs and we begin getting signs of it even before the media can react to tell us what is happening. And we begin to react ourselves in this world community before any organization, agency, or government even knows what is happening and can themselves react to the situation. Realtime response globally is a new concept, which unifies our world community in a way that it has not been presented previously in any media. 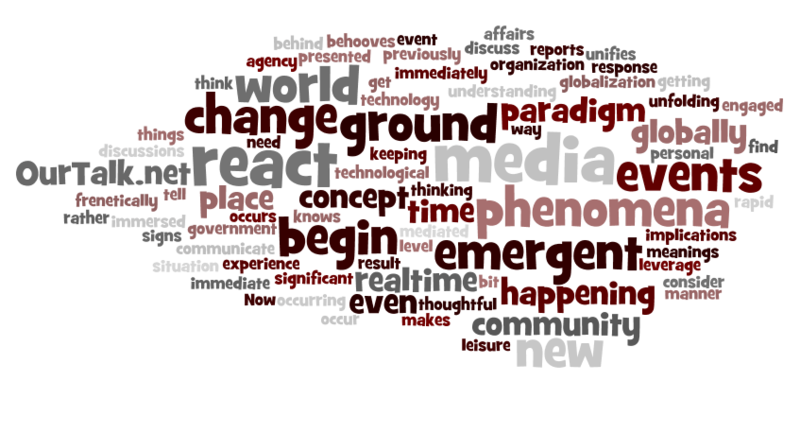 We react to emergent events as they are occurring globally on a personal level, and we get reports from on the ground, and communicate with those on the ground immediately as events are unfolding. This is a new emergent phenomena itself, and I think will result in a paradigm change because it makes globalization an immediate phenomena that all of us can experience. OurTalk.net is a place where we can consider the implications of this paradigm change and other significant phenomena of our time in a thoughtful manner in keeping with the need for understanding in this time of rapid emergent technological change.